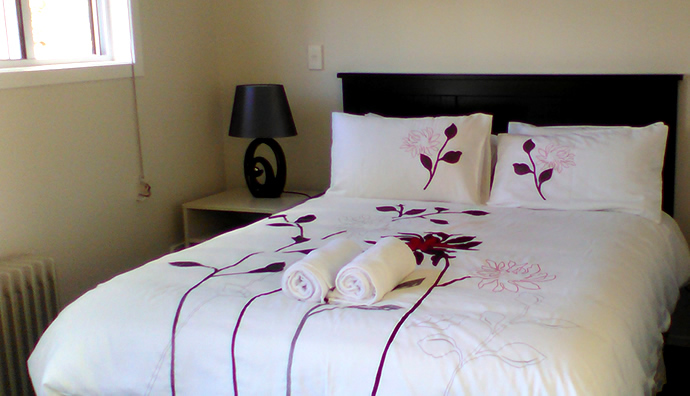 Jonios offers Bed & Breakfast accommodation in three studio rooms located on an 11 acre Olive Grove in Te Kauwhata. Jonios offers Bed & Breakfast accommodation in three studio rooms located on the property- the Koroneiki Studio, the Leccino Studio and the Frantoio Suite. All rooms have air conditioning, ensuite, satellite TV, internet access and much more to ensure a comfortable stay. Continental Breakfast is included. Cooked meals (breakfast & dinner) can be arranged on request: please check with us in advance. Jonios is located less than 5 minutes drive from the township of Te Kauwhata. If you are looking to stay in the centre of Te Kauwhata township, Jonio's offers quality accommodation right on the Main Street. Piccolo Studio (opened September 2014), and Centro Studio (opened April 2015) feature open plan living with all the modern conveniences of home, with essential amenities such as milk, bread and juice to get you started. Local cafés, restaurant/bar and shops are right on your doorstep. Thank you for your booking request.We will be in touch as soon as possible. NEW! Located behind Piccolo Studio in the township of Te Kauwhata, the Centro Studio offers good sized accommodation with sliding door opening out onto a sunny terrace. Watch Sky on your 40" TV from the open plan lounge with sofa bed. Features a full kitchen, with dining area along with washing machine, dryer, Iron and ironing board. Enjoy the comfort of a Sealy Posturepedic bed, private ensuite with shower, fluffy robes and hair dryer. All the conveniences of home, including free wireless internet access, air conditioning and secure off-street parking. Good sized studio adjacent to the main house. Features a Sealy Posturepedic bed, double sofa bed and rollaway if required. Kitchen with microwave, dining table and fridge. Ensuite with shower, fluffy robes and hair dryer. Free wireless internet access and Sky TV. Iron and ironing board in the room, Washing machine and dryer available. Deck with outdoor table overlooking the olive trees. Compact studio in a separate building from main house. Features a Sealy Posturepedic bed plus double sofa bed. Kitchenette with microwave, grill, dining table...even a rice cooker. Washing machine and dryer tucked in behind the bathroom door, iron and ironing board, fluffy robes and hair dryer. Free wireless internet access and Sky TV. Outdoor table & chairs. Spacious open plan unit located in a separate building to the main house, alongside the Koroneiki Studio. Features open plan lounge and kitchen with separate bedroom and a Sealy Posturepedic bed. Full Kitchen with microwave and dining table opens on to a large deck overlooking olive trees. Ensuite with shower, fluffy robes, hair dryer and walk-in wardrobe. Free wireless internet access and Sky TV. Iron and ironing board in the room. Washing machine and dryer available. Located right on the main street of Te Kauwhata, this sunny studio opened in September 2014 and offers open plan sitting and dining area with full kitchen. Features a Sealy Posturepedic bed plus double sofa bed. Ensuite with shower, fluffy robes and hair dryer. Free wireless internet access and Sky TV. With washing machine, dryer, Iron / ironing board and air conditioning. Secure off-street parking.